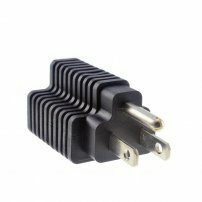 Plug Adapter 15 Amp Household Plug to 20 Amp T-Blade Female Outlet Adapter (NEMA 5-15P to 5-15/20R) 15 Amp Household Plug to 20 Amp T-Blade Female Adapter [AP005885] - $7.95 : allputer.com - Accessories for all your Portable Electronics & Computers! This is a 15 Amp to 20 Amp T Blade Adapter. It is Over molded Adapter with NAME 5-15P Male plug to NEMA 5-20R 15/20A T Blade adapter. It is a very useful convenience plug adapter.